KENNEDY SPACE CENTER, FL – SpaceX accomplished an American ‘Science Triumph’ with today’s “Mind Blowing” and history making second launch and landing of a previously flown Falcon 9 booster that successfully delivered a massive and powerful Hi Def TV satellite to orbit for telecom giant SES from the Kennedy Space Center. Note: Breaking News story being updated. The milestone SpaceX mission to refly the first ever ‘used rocket’ blasted off right on time at dinnertime today, Thursday, March 30, at 6:27 p.m. EDT. It carried the SES-10 telecommunications payload to orbit atop a ‘Flight-Proven’ Falcon 9 rocket from seaside Launch Complex 39A at NASA’s Kennedy Space Center in Florida. 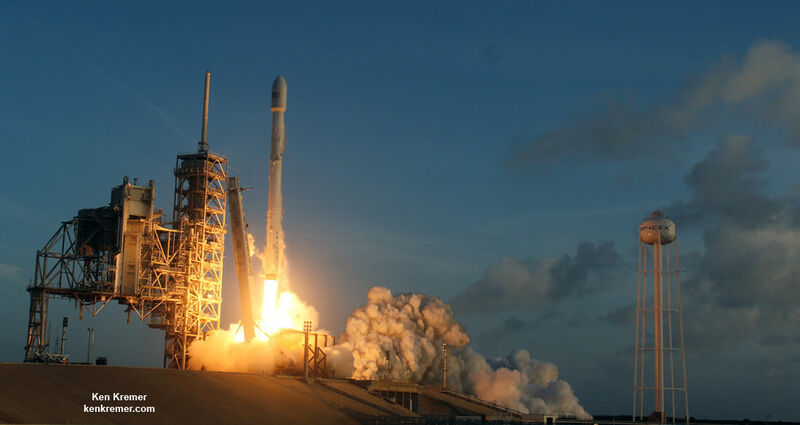 The recycled Falcon delivered the nearly six ton SES-10 satellite to geostationary transfer orbit where it will provide significantly improved TV, voice, data and maratime service to over 37 million customers across Central and South America. The daring mission to relaunch a used booster dubbed ‘Flight-Proven’ seems like its straight out of a science fiction thriller. Yet today’s stellar results fully vindicates billionaire SpaceX CEO and Chief Designer Elon Musk’s bold vision to slash launch costs by recovering and reusing spent first stage rockets from his firms Falcon 9 launch vehicle. For the first time in world history a recovered and ‘Flight-Proven’ rocket has actually launched on a second mission and not only roared aloft but survived intact all the way to its intended orbit and delivered a second satellite to orbit for a paying customer- in this case the commercial TV broadcast satellite provider SES- one of the world’s largest. “We are confident in this booster,” Halliwell told me at a prelaunch press briefing on March 28. This recycled Falcon 9 first stage booster had initially launched in April 2016 for NASA on the SpaceX Dragon CRS-8 resupply mission to the International Space Station (ISS) under contract for the space agency. Furthermore, after the 156 foot tall first stage booster completed its primary mission task, SpaceX engineers successfully guided it to a second landing on the tiny OCISLY drone ship for a soft touchdown some eight and a half minutes after liftoff. OCISLY had left Port Canaveral several days ahead of the March 30 launch and was prepositioned in the Atlantic Ocean some 400 miles (600 km) off the US East coast, just waiting for the boosters 2nd history making approach and pinpoint propulsive soft landing. It thus became the first booster in history to launch twice and land twice. And this magnificent achievement was accomplished through the dedication and hard work of engineers and scientists who benefited from the American education system that cultivated and nurtured their talents – like generations before them – and that we as a country must continue to support and fortify with reliable and ample research and development (R&D) and educational funding – now and in the future – if we wish to remain leaders in science and space. The entire Falcon 9/SES-10 launch and landing was broadcast live on the SpaceX hosted webcast.